FX is committed to staying up in Minnesota. The cable channel has renewed their Fargo TV show for a third season. The second season, which is currently airing on Monday nights, has been averaging a 0.34 rating in the 18-49 demographic with 1.22 million viewers (per the live + same day ratings). That’s way down when compared to the first season’s numbers but it’s a big hit with the critics. LOS ANGELES, November 23, 2015 – FX has ordered a third installment of the Emmy(R), Golden Globe(R), AFI and Peabody award-winning limited series Fargo from Creator Noah Hawley, it was announced today by Eric Schrier and Nick Grad, Presidents of Original Programming for FX Networks and FX Productions. The second installment of Fargo currently ranks as the most critically-acclaimed television of 2015 according to Metacritic with a score of 96 out of 100, and it also scored 100% on Rotten Tomatoes and had the highest average critics’ rating of any show on TV this year with 9.1 out of 10. Fargo returns with an all-new episode tonight – “Did you do this? No, you did it!” (Episode 7, Airs November 23, 10:00 pm e/p) – Lou and Hank investigate in Fargo, The King of Breakfast visits Betsy and Molly, Floyd is summoned away and Bear questions a family member’s loyalty. Written by Noah Hawley and Matt Wolpert & Ben Nedivi; directed by Keith Gordon. Emmy Award winning Executive Producers Noah Hawley, Warren Littlefield, Joel & Ethan Coen, and John Cameron will all return for the new installment. FX’s Fargo is produced by MGM Television and FX Productions, with MGM Television serving as the lead studio. The first installment of Fargo garnered universal critical acclaim and won three Emmy awards, including Outstanding Mini-series, two Golden Globe awards, including Best Mini-Series or Motion Picture Made for Television, and a Peabody Award. 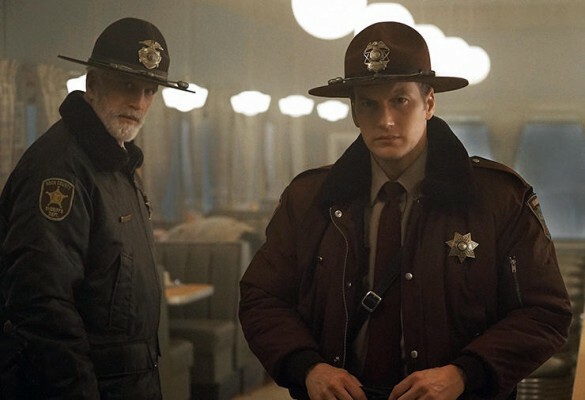 The second installment of Fargo, currently airing on FX, follows a young State Trooper (Patrick Wilson) and his Sheriff father-in-law (Ted Danson) as they investigate a grisly case involving a local crime family and a major mob syndicate, and a small town beautician (Kirsten Dunst) and her husband (Jesse Plemons) who inadvertently get caught in the middle. What do you think? Are you a fan of the Fargo series? Would you like to see some of the characters from the first two seasons return for season three? More about: Fargo, Fargo: canceled or renewed? When will season three be aired? Can’t put down book.” Can’t wait til next episode. Thanks FX.